Whether it's an art nouveau hotel with chandeliers you're after or a cosy, reasonably-priced guesthouse, you're sure to find the right hotel for you in this guidebook on the Top 10 Hotels in Vienna. Book a hotel in Vienna and enjoy romantic coffee houses adorned with chandeliers and the fairytale palaces of the Habsburgs. Dance to the Blue Danube, or go for a spin on Vienna's Big Wheel - the Riesenrad. Plan your romantic stay in Vienna with this guide. Whether you go to gaze at the palaces of the Habsburgs or whether you fancy a stroll along the Danube, the right hotel will ensure you get the best out of your trip to Vienna. Pick out your hotel in Vienna using this guide, which covers the most important districts of the city. Imperial palaces, royal parks and landmark art galleries will captivate your senses during your short break in Vienna. This guide is designed to inspire you to get the very best from your stay in one of Vienna's hotels. The land locked country of Austria, comfortably sat in the middle of mainland Europe is home to a melting pot of cultures within its capital city of Vienna. 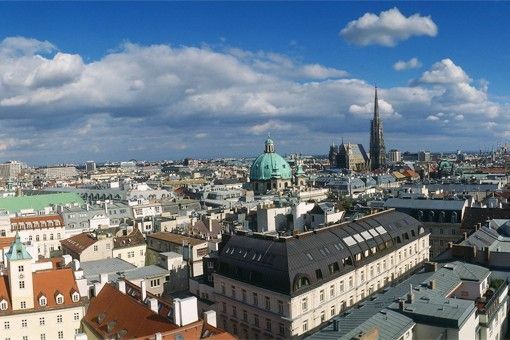 Vienna is made up of 23 districts; the first 9 districts are the closest to the city center, with Innere Stadt being the 1st and Alsergrund the 9th, many of which house fascinating museums and beautiful parks. From 10 onwards the districts spiral outwards in a clockwise motion. A Vienna city break glides effortlessly between the past in gilded Hapsburg palaces and art galleries and the present in slinky lounge bars and design-driven boutiques. Book a Vienna hotel to discover a city full of fairy tales and 21st-century fantasy. A whirl of baroque music and palaces or a film set for The Sound of Music - there’s a Salzburg city break for everyone. Book a Salzburg hotel to discover your favourite things about this cultured Alpine city. Discover lavish Hapsburg palaces and Mozart symphonies, luscious cakes and Alpine skiing holidays in Austria. Book a hotel in Austria to discover a country loaded with culture and packed with memorable landscapes. Whether you want to stay near the best shops and markets, next to the Stadtpark or by the quirky renovated Spittleberg houses, there is a vast choice in this melting pot of a city we call Vienna. This guide to the districts of the city will help you choose the perfect location for your trip. The first nine districts out of the 23 are the closest to the city centre. Book a Vienna hotel for a romantic whirl of chandelier-lit coffee houses and storybook Hapsburg palaces. Waltz along the blue Danube or take a dizzying ride in the Riesenrad Ferris wheel. Use this guide to find your vision ofRomantic Vienna. Warm up over mulled wine at a Christmas market or chocolate cake in a grand coffee house on a winter break in Vienna. Book a winter hotel in Vienna to be swept off your feet at palace balls and open-air ice rinks. Whether you want to gaze at Hapsburg palaces or stroll along the Danube, deciding where to stay in Vienna will help you make the most of your visit. Choose a Vienna hotel using this guide to the city’s key neighbourhoods. Whether you're seeking chandelier-lit Art Nouveau opulence or a homely and inexpensive guesthouse, you'll find a Vienna hotel to suit you with this handy guide to the top 10 hotels in Vienna.